I just got back from my trip to Alabama, and I’m definitely in catch up mode… so instead of What I Wore Wednesday today, I thought I’d share another One Piece Many Ways (see this post for an introduction). I’ve been doing daily Fashion Diaries for almost two years now… mostly as a fun way to chronicle my days, but I started to think of how I could actually put those pictures to use for my own reference… and it all clicked recently as I’ve seen how some of my favorite blogs organize their outfit archives by individual pieces. I started going through my fashion diaries and picking out some of my favorite staple items, the clothes I turn to time and again when I can’t think of anything else to wear. 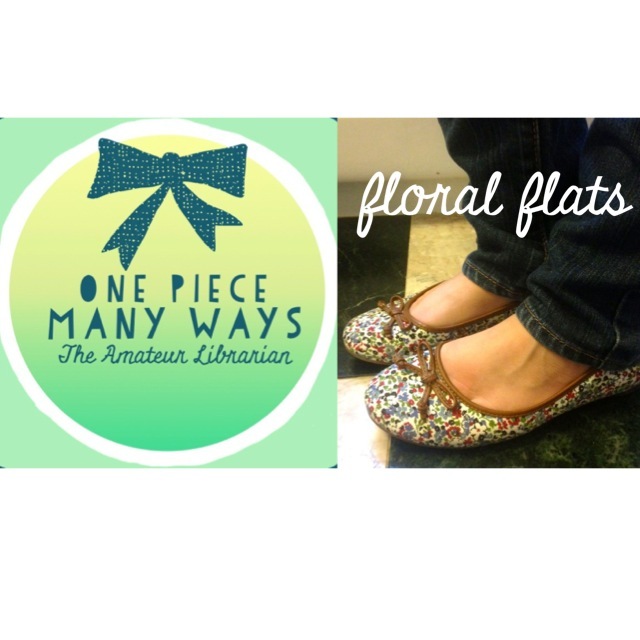 I love my floral flats… when the rest of my outfit is pretty plain, or all solid colors. I found these on eBay, new in the box – they are actually children’s size from Land’s End! But I think the concept applies for any flats with a busy print. Below are my five favorite outfits with my floral flats (click each picture for a link to the original post)! This was a fun exercise, especially since I’ve already done all of the work in my weekly fashion diary posts… I’m no style blogger by any means, but I do try to have fun when it comes to my wardrobe. Stay tuned… it probably won’t be a weekly thing, but I just might hunt through my fashion diaries again to do another post in this series some time soon! I love that you can pick up on any one of the colors from the shoes to play off of in the rest of your outfit.